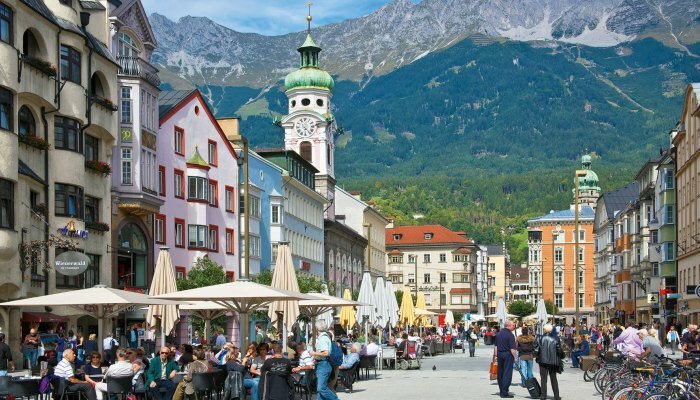 Austria is beautiful and another country that reminds me of New Zealand with the fields of green grass but it does have lots more trees than we have and the Austrian Alps. Going on the train from Vienna to Lichtenstein was just so amazing. I only went to Vienna but so enjoyed myself. Vienna I arrived in the morning after a uncomfortable long train ride from Venice and this cemented in my mind that there is no way is shall ever take a train in or out of Italy again. Anyway on arriving the one thing that I have always wanted to see in Vienna is the Spanish Dancing Horses and so made my way there for an absolutely wonderful show which went for 1 ½ hrs. It was so worth the money, I loved it! Next on the list was the Danube. This can be reached by underground train and Vienna has an easy system to work out. Maybe because I have travelled lots and use the underground in nearly every city I visit that I find them easy as I seem to help tourists all the time as they find them hard to work out. It does get easier the more you use them. When you hop off the underground for the Danube you are actually on a bridge. Walking around this area is nice and on the banks there were lots of people just lazing in the sun. You can then head over another walk bridge and go to the island in the middle. This is not a very well kept island but there are seats and lots of open areas to sit and view either both sides of Vienna and the hills up behind this city. There is an interesting group of sculptures in the middle of this island. (Rather graphic). By my standards now, this is a small city that is beautiful and unrushed. It also is safe and my wondering and window shopping at night made for a nice stroll without a second look by anyone. Day trips can be taken to all sorts of small villages that are within an hour of Vienna, including one that looks down on the city. The day I went to the Palace there was a farmers market and fair on. It would seem from the mass of vegetables and flowers that there is some great and dedicated farmers in Austria as the size and variety where amazing. I struck it on the right day as over the road in the grounds in front of the museum was a ‘Thailand’ day. Here you could try Thai food and buy traditional Thai produce and pick up pamphlets and check out deals for travelling to Thailand. And not to leave New Zealand out I was to spot a flyer in a shop window promoting a N.Z. Maori Cultural group which was in Vienna for a week doing concerts. I don’t have time to miss home with Kiwi’s being everywhere I go. Hofburg Museum is a must for museum enthusiasts. Go to Musuemi Quartier. It’s within easy walking distance of the centre of Vienna and is an interesting walk. Go to see the Spanish dancing horses, you wont regret it.